Features, specifications and drawings for lighting control in the palm of your hand. traditional dimmers and whole-house automation systems. Decora Digital Dimmer – a powerful device combining the best of Leviton dimmer and timer functions with today’s technology. Just use your smartphone or tablet to control, adjust and time lighting for daily activities or to ensure a “lived-in” look while away. Decora Digital Switch – users enjoy the combined functions of a standard wall switch and a countdown or programmable timer switch in one attractive device. Using the app to set timer functions makes it quick and easy to control lights. 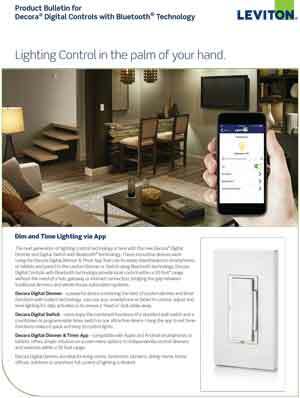 Decora Digital Dimmer & Timer App – compatible with Apple and Android smartphones or tablets; offers simple, intuitive on-screen menu options to independently control dimmers and switches within a 30 foot range. offices, outdoors or anywhere full control of lighting is desired. Lighting Control in the palm of your hand. * 30 foot Bluetooth range: Range may vary depending on specific conditions of installation, configuration of walls, obstacles and other factors. Decora Digital Controls come packaged with three colors. Products with suffix (-Z) include White, Ivory and Light Almond. Color Change Kits are available in the following colors: White (-W), Ivory (-I), Light Almond (-T), Gray (-G), Black (-E) and Brown (-B). App Store, Google Play and the Bluetooth word marks and logos are the registered trademarks of Apple Inc., Google Inc. and Bluetooth SIG, Inc., respectively, and any use of such marks by Leviton is under license. All other third party trademarks are the property of their respective owners. For more than 60 years, we've delivered innovative products and supply chain solutions to the construction, industrial and utility industries. And the core values from our very beginning have always stayed the same: We make customers our primary focus. Our solutions and services rooted in deep expertise and industry diversity make us a powerful supply chain partner for businesses across a broad, growing customer base. Are you ready to partner with an industry leader and start delivering more revenue to your bottom line?